Test Valley Borough Council, working on behalf of Hampshire County Council, intends to widen the footway on the south side of Weyhill Road to accommodate a shared-use cycleway. That quote from the Test Valley Borough’s consultation earlier this year on the half-mile scheme in Andover, Hampshire, flags up almost immediately that it is yet another box-ticking bodge from cycling-infrastructure inept Hampshire County Council, the highway authority in these parts. The give away? The phrase “shared-use”. Thankfully, Councillor Seán Woodward, who says he is the one who will be making the decision about implementing the scheme, has stated in an article in the local Andover Advertiser newspaper that he is still open to hearing suggestions for improvement. some emails from the Test Valley Borough Council justifying their design are included at the end of this article; as well as other emails with Hampshire County Council and my MP. See UPDATES. a letter to the editor was published in the Andover Advertiser on 8 May 2014. See USE DUTCH STANDARD FOR CYCLEWAYS – it elicited a nice response the following week. In a nutshell, the proposed scheme is just shifting conflict: cycling/driving conflicts now become cycling/walking conflicts and even cycling/cycling conflicts, because the cycleway is bidirectional – there is not one on the other side of the road! What’s worse, there is still conflict between people cycling, walking and driving: they all come together at intersections in a big mess of “shared” space where the justice system and the infrastructure are heavily weighted (pun intended!) in favour of multi-tonne motor vehicles. Plus, this wouldn’t be Hampshire if a cycleway didn’t suddenly end and people were forced to dismount, cross a road (with no priority) and continue the other side. Instead of a proper prioritised crossing, the councils are to put in a “refuge island”. I’m not making this up. This is England in the 21st century! Laughable if it weren’t so potentially deadly. It is no wonder that there is already one professional cycle instructor who has stated his advice would be to stick to cycling in the road for safety’s sake. …have identified that around one in four cyclists travelling along Weyhill Road are currently using the footway. Clearly, not all people travelling along Weyhill Road currently feel safe cycling on the road with motor vehicles; and so have escaped to the perceived safety of the pavement – I say perceived because negotiating the various obstacles Hampshire County Council has erected on the pavement, let alone avoiding people walking, pose their own safety issues. Aside: although illegal to cycle on the pavement, the government recently re-affirmed the Ministerial Guidance on Pavement Cycling through a letter written to the ‘Stop Killing Cyclists’ campaign group. The plans put out for consultation by the Test Valley Borough Council and Hampshire County Council, who are the highway authority, propose a 3m wide “shared use” path from Monxton Road down to The Drove. There are also a couple of “additional crossing points”. Bastards. I swear there must be groups of people in Hampshire County Council who watch Deer Hunter on repeat. Know this councils: If there is room to build “refuge islands” in the middle of a road then there is room to build proper Dutch-style segregated bicycle lanes each side of the road instead. The councils here, like all of the others across the UK, continue to get simple infrastructure design wrong. Why? Because they are asking the wrong question (tip of the hat to ‘Copenhagenize’ for putting it so succinctly). These changes will in all likelihood mean that more space will have to be taken from the road used for parking and the driving of cars, buses and lorries; and given over to the segregated paths. This is A Good Thing: it will mean more people will be able to travel along that route, and further afield, in more safety. The road danger will have been reduced. Officers and councillors have forgotten – or never thought about in the first place, more like – that many of the people driving cars right now are the same people who may have chosen to cycle to their destination if only the there had been proper, Dutch-style segregated cycling infrastructure. There would still be space for driving; and in addition there would be space for cycling, and improved space for walking. I’ll go further: making these changes to the plan will make the area more ‘liveable‘, which is especially important with a school further down along that same road; and the offices of the Test Valley Borough Council! So, the Weyhill cycleway shared use scheme is a Bodge, a Box-ticking Boondoggle: The council is all set to spend money they’ve received from housing developers on a scheme they think answers points made in the Andover Town Access Plan but is, in reality, not fit for purpose (and doesn’t address the actual recommendations in the plan). People driving will still have the ability to kill or seriously injure in a split second – unintentionally albeit possibly due to stupidity, but dead is dead – unless something better is put in place. People walking will still be vulnerable to people cycling as they must negotiate the shared cycleway space: with people cycling in both directions! The opportunity is there for the councils to Get Britain Cycling – or at least this little corner of it – by creating proper, Dutch-style ‘space for cycling‘. I urge you to take up Councillor Seán Woodward‘s offer of listening to more public input. Write to him now at sean.woodward@hants.gov.uk. Below are email exchanges with various councils relating to this scheme and ‘Space for Cycling‘ more generally. These emails with the TVBC involve Robert Drew, Projects Engineer, Engineering and Transport team at Test Valley Borough Council (the highlighting is my addition). So the council consulted itself over the scheme! (ref HCC email from Cllr. Seán Woodward on May 1, 2014 16:55). Could you tell me what the current implementation plans are for the cycle route along Weyhill Road, Andover, please? I note there was a consultation that ended in February and wanted to know what changes have been taken on board (if any). The plans have not substantially changed as a result of the consultation; minor changes have been made to reduce the impact on particular residents. HCC are currently considering the proposals and a decision will be made on whether or not to proceed in June. I note your preference was for dedicated segregated cycle lanes. I would agree that a ‘Dutch Style’ streetscape would be very nice to provide, however we have to consider what is achievable and appropriate within existing constraints. The key constraints here are the available width of public highway and the available funding. To provide segregated cycle lanes within the carriageway in both directions would require widening Weyhill Road by up to 3m and subsequently shifting the footway. This is not achievable for some lengths and would involve works of a different order of magnitude than those proposed. The proposal for a shared use route requires widening the footway by 1m and the relocation of street furniture which is achievable, this would facilitate the existing behaviour of cyclists and provide a route for less competent cyclists. You are making the road MORE dangerous for people who choose to cycle or walk. I would like to ask what studies and consultation with experts and cycling campaigners the council have undertaken? May I see the reports please? I don’t agree that these proposals would make things more dangerous for cyclists or pedestrians, given that a number ride along the footway with the existing arrangements. The decision to progress a proposal for a shared use route was taken after HCC considered the feasibility of providing one. 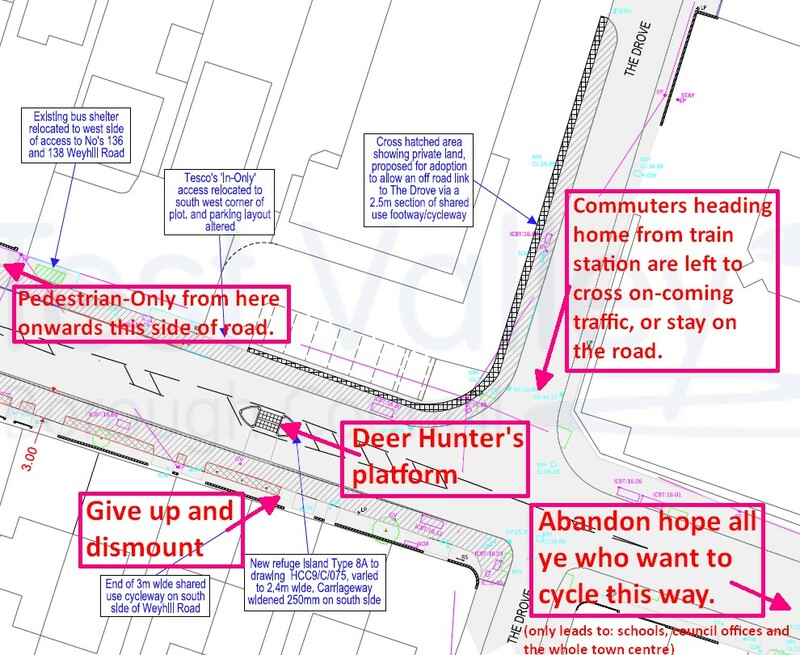 The cyclist-priority layouts you’ve given as an example are physically possible, but not something that Hampshire Highways are looking to achieve on this route. One consideration is the cost, although this would less prohibitive if you could leave the existing kerb line and drainage arrangements in place by narrowing the road to one lane. However a big issue would be the objections from other road users. I feel it’s unlikely the Highway Authority or residents and businesses would support such a scheme as it would reduce the capacity of Weyhill Road. To radically change the character of Weyhill Road to a cyclist-priority route would need public and political support, approval from the Highway Authority and a big budget. We have proposed a shared use route as something that can actually be provided; the alternative at present is no change for cyclists. Thank you for that refreshingly honest reply, Drew. I agree with you that it would take proper consultation to put in proper, safe space for cycling – it is important to have all stakeholders on board. The situation will be more dangerous: presently people who feel intimidated off of the road and take refuge on the pavement are doing so illegally and can be discouraged (policing!) for doing so. In the proposals though, the councils are actively encouraging people to legally cycle on the shared use path which puts them in jeopardy at intersections and in conflict with people who choose to walk. In addition the entry/exit of the routes are poor, especially if you must dismount and cross a road to get on to them. I asked earlier, but maybe you missed it, could you provide those studies and reports please, and indicate which groups were consulted? p.s. You mentioned about reducing the road to just 1 lane for motor traffic and creating a “cycle priority” route. That was not my suggestion, and I am sorry if my comments somehow left you with that impression. I desire to see fair and safe distribution of people whether they choose to cycle, walk or drive. Look again at the example I referred to from The Netherlands: the road provides maximum people (not just car) throughput and is fair to all modes of transport. I realise your suggestion was focused on a more generous provision for cyclists and avoiding impacting pedestrians. I was just pointing out some of the compromises that would require, and the significant works to achieve it. There are some sections which could accommodate dedicated cycle lanes both sides, however there are other sections that would require 3m additional width which is not available within the highway. The example in the Netherlands had made those compromises; I don’t think that would be achievable on Weyhill Road. I wasn’t ignoring your question about studies and reports; I only have knowledge of TVBC’s policy documents, the community street audit, a pedestrian crossing survey at The Drove and the feasibility study on the shared use route. This is a scheme I am working up on behalf of the Highway Authority, Hampshire County Council, and you will need to contact them directly for a formal response. They are progressing this scheme for highway safety reasons, tackling various issues identified during a community street audit and highlighted by complaints to them and us over the years. The upgrading of the zebra crossing Portway Close and the pedestrian refuge island at The Drove are items that HCC may wish to progress separately whether or not the cycleway is given approval (these are also the costly areas of work, the work required to widen the footway is relatively minor). The Borough Council support the scheme; improving non-motorised infrastructure is part of the council’s strategy and access plan, and although this is perhaps not the ideal provision for cyclists it is an achievable way of providing the link. It’s my opinion that providing a suitable width for cyclists and pedestrians to share the route is the best solution in this instance. I think we disagree on this point, it is a balance of risks; however cyclists will use this footway whether we provide extra width and designate it as a route or not, and there are currently no alternative options. Cyclists who prefer to ride on the road could of course continue to do so. I think if the new route encouraged more people to cycle that would be a positive outcome. These emails with the Northern Test Valley Bicycle User Group (BUG) came about because HCC Cllr Seán Woodward stated that the BUG were consulted over the Weyhill scheme. Turns out the contact details for them was the planning policy group at Test Valley Borough Council. I emailed the group and received a reply back from the council – the same Robert Drew who corresponded with me earlier! Moreover, the chair of the BUG turns out to work for the council too. So, in other words, the council consulted itself over its scheme! (ref HCC email from Cllr. Seán Woodward on May 1, 2014 16:55). I was given this contact address for BUG. I was told you were consulted on the Weyhill Cycleway but chose not to respond. Could you tell me your position on it? Do you feel, like me, that it does not fulfill the Space for Cycling objectives? Has your group attempted to get various governments to work together to secure appropriate funding so that safe infrastructure such as that seen in The Netherlands is installed there and elsewhere in Andover and surrounding villages & towns? Test Valley Borough Council support the proposal for a shared use route on Weyhill Road. Relevant policy documents are the Andover Town Access Plan and Cycle Strategy and Network, this route achieves objectives set out in both. An updated draft of the Cycle Strategy and Network is being considered for adoption at the moment, and includes this link. We feel the proposed shared use route is an achievable option. I do feel that this scheme meets many of the objectives of the Space for Cycling campaign. To achieve a street scene like the ones you reference in the Netherlands along Weyhill Road would require a scheme of a different magnitude than the one proposed. A jump from hundreds of thousands, where much of the cost is for works not related to the cycle way directly, to millions. I don’t consider it realistic to anticipate the Highway Authority would prioritise that level of funding, or that a scheme of that magnitude would necessarily have the support of the highway authority or public. If there was more public pressure for vastly improved cycle infrastructure in Andover, or if the Highway Authority had some millions available that could not be more effectively spent on other schemes, then it might be a feasible option. The Highway Authority are allocating funding primarily to resolve safety concerns for pedestrians and cyclists, sourced from developer contributions to the area and the LSTF fund. From TVBC’s perspective this is a great opportunity to create a new part of the cycle network. Hampshire County Councillor Seán Woodward, whom I’ve now copied on this email, said that the local Bicycle Users Group was consulted on the scheme — but now I find out that the BUG is actually made up of the Test Valley Borough Council itself! So the council consulted itself on its scheme! Oh dear! This doesn’t look very good at all in my opinion. Can you provide me with all the feedback you received during the public consultation that took place earlier this year? I could find no minutes from the BUG’s most recently meeting which I presume covered the Weyhill scheme (the September minutes refer to it being upcoming). Regarding your Space for Cycling comment: I feel the Weyhill scheme does NOT fulfill any of the campaign’s objectives and it would be wrong of councils to mislead people into thinking it does. Shared space is most definitely NOT included as it increases dangers to people who walk; and the intersections along Weyhill’s scheme give priority to dangerous cars. 5. Maintain roads with cycling in mind. When resurfacing roads, make space for cycling. The following emails are with Hampshire County Councillor Seán Woodward who has stated that he is the one to decide if the cycleway plans are implemented. Could you tell me when you will be making a decision about the proposed cycleway along Weyhill Road in Andover? Can you also tell me in what ways the draft plans have been updated to conform to Dutch standards, which would make it a safe alternative to cycling on the road with car traffic? Thank you for your email regarding the proposed Weyhill Road shared use cycle way. I can confirm that I will be making a decision on whether this scheme is progressed at my decision day on 10th June 2014. My response to your second point, regarding how the scheme has been updated to conform to Dutch standards, is in line with comments already made to you by the engineer from Test Valley Borough Council who undertook the design work on behalf of Hampshire County Council. Whilst some changes have been made to the proposals in line with comments made during the consultation process, these have been minor improvements to allay concerns regarding access to properties by some residents. The scheme has not been updated to conform to Dutch standards because in order to achieve the segregated cycle lanes you suggest in your photographed example, for both directions of travel, it would require Weyhill Road to be widened by up to 3 metres and the subsequent relocation of the footway to accommodate this. This is not achievable for a consistent length of Weyhill Road to achieve the route as we do not have sufficient land in the ownership of the Highway Authority. Acquiring such, if actually available for the length required, would mean works of a different order of magnitude and costs than those proposed. The Test Valley Borough Engineer has already provided some thoughts on the other examples you mention in your blog. Hampshire County Council supports the views expressed by the engineer. When we asked Test Valley Borough Council to undertake this work on our behalf it was on the understanding that they would use design guidelines relevant to the UK, which they have done. Notwithstanding this we are committed to looking at innovative design solutions for transportation schemes and welcome your comments but in this case there isn’t the scope to provide facilities such as the Dutch examples you provide due to the constraints outlined above. I trust this answers your questions and I will take all comments received on this proposals into consideration when I make my decision on 10th June. Could you please tell me which sections of the CROW manual you based your statement on regarding the 3m requirement that you referred to? Could you provide me with the studies/figures on the safety assessments carried out along with details of their consultations with cycling bodies and organisations? The statement in my previous email regarding the need to widen Weyhill Road by 3 metres takes no account of the CROW Design Manual for Bicycle Traffic. It is just an initial assessment of the additional road space that would be required to accommodate the segregated cycle lanes to which you refer. The design guidance that Hampshire County Council uses for schemes involving non motorised users is informed by the Department for Transport’s Design Manual for Roads & Bridges. A preliminary design stage safety audit was undertaken on the 25th June 2013 on the proposed off-road cycle route along Weyhill Road in Andover, between the Hundred Acre Corner and The Drove. The audit has been carried out in accordance with the requirements specified in Hampshire County Councils Quality Assurance procedure for the Safety Audit of Highway Scheme and identified no safety issues. The public consultation was open to all including local cycle organisations. The local Bicycle Users Group (BUG) was made aware of the proposal and made no comments regarding the scheme. Could you tell me which bicycle user group you contacted and how I can reach them? I note today’s announcements by the Roads Minister at the CycleCity expo in Leeds. Will the cycleway scheme be taking advantage of the things announced? I may have missed your reply … Could you tell me which BUG you consulted and how I can reach them? Thank you for your e-mail. I do not recall the first one. The bicycle user group referred to is the Northern Test Valley BUG. It can be contacted at planningpolicy@testvalley.gov.uk. The speech given in Leeds by the Roads Minister, Robert Goodwill MP, mentioned the Local Sustainable Transport Fund (LSTF) being able to help deliver smaller schemes. I can confirm that the Weyhill Road Cycle scheme is already partly funded by the LSTF as part of a successful bid made by Hampshire County Council to that fund. Huh? The email is for planning policy in the local government? They were consulted about their own plans but didn’t respond? The following emails are with Sir George Young, MP for North-West Hampshire, which includes Andover and also my town of Whitchurch, Hampshire. Will the government step in to ensure that proper segregated Dutch-style cycle paths are built in your constituency? Both on Weyhill Road and along roads near Whitchurch: the B3400 between Whitchurch and Overton which serves the new gin distillery; and Winchester Road leading down to the A34 and to Tufton? Thank you for your email dated April 29th, and I have sent a copy of it to Cllr Sean Woodward and Robert Drew, asking if they might respond to the opinions which you sent to them. Responsibility for the Weyhill Road and the B3400 rests with local authorities, rather than with the government. Thank you for your reply, which I received in the post yesterday. (I have also now copied in now HCC Cllr Tom Thacker because my points relate to the B3400 path he is proposing in Whitchurch). While it is local authorities who are responsible for building the cycleway, it is you in national government that they have both told me they are relying on for (a) design criteria; and (b) funding to provide proper Dutch-style space for cycling. This is now an incredible opportunity for governments at all levels to demonstrate how they can work together to deliver Dutch quality levels of space for cycling. Mr Goodwill also emphasised that the Local Sustainable Transport Fund has been and can be utilised to provide space for cycling. Will this be taken up? This opportunity to work together must be seized by yourself, along with Mr Woodward and Mr Drew, for Andover’s Weyhill Road cycleway; and with Mr Thacker for the path he proposes along the B3400 in Whichurch. After his speech Mr Goodwill was given a copy of the ‘Making Space for Cycling’ guide that is endorsed by many leading cycling groups include British Cycling, CTC, Cycling Embassy of Great Britain, London Cycling Campaign, Cambridge Cycling Campaign, and the Campaign to Protect Rural England. I want to see you and the local councils build on this opportunity to demonstrate the profound economic and lifestyle benefit that creating space for cycling can realise for people 8 to 80 who are living, working and visiting the Weyhill Road area in Andover and travelling along the B3400 in Whitchurch.